White Ovals with Brilliant Blue 4mm facetted agates. A diamond weave drop design bridal necklace. All sterling silver. We added this to show how the necklace sits in the neckline although this is the amethyst version. For a look of refinement and elegance for any white bridal gown, here’s your “something blue” right here. This will have you looking like the goddess you know you are, for your wedding day and beyond. 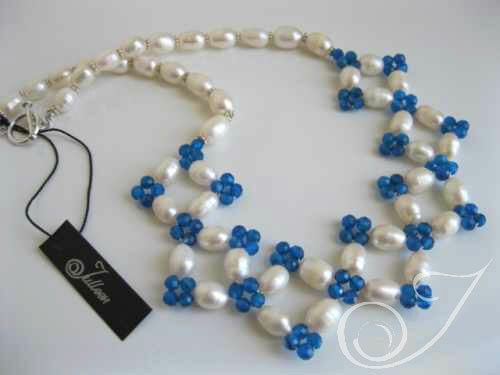 These darling brilliant blue facetted agates, make this necklace so striking. Quite rare , these agates were quite a find for us, as genuine gemstones are not easily found in this wonderfully brilliant peacock blue. Stunning in anyone language.